Wachapreague is on the seaside of the Eastern Shore of Virginia. Population 236. It's the flounder fishing capital of the universe. The Wachapreague Channel winds from the town, through the marsh, out to the barrier islands. Between Cedar and Parramore Islands it reaches the Atlantic Ocean. Easy access to the marsh and ocean makes this a popular place for fishermen. Until 1872 this area was just a single farmhouse and its fields. Then a wharf was built and produce was shipped from here to northern markets. In 1884, a steamboat began making trips between Wachapreague and New York City. Hotel Wachapreague became a popular destination of visitors from the north. Marinas, boat ramps and a couple restaurants line the water. You can rent a boat to go out to the barrier islands (experience in handling a small boat is required). For a deep-sea fishing adventure, get a spot on a charter boat. Northern end of Atlantic Avenue. This complex serves as both a fieldstation in support of research and teaching and as a site for resident research in coastal ecology and aquaculture. By virtue of its access to unique coastal habitats, excellent water quality, and an extensive seawater laboratory, the ESL affords educational and research opportunities not available elsewhere within the region. Over its 40-year history, the laboratory has become internationally recognized for shellfish research, with important contributions to molluscan ecology and culture. There are two places to eat in Wachapreague. Fish Tales Restaurant at the Wachapreague Marina (15 Atlantic Avenue), has breakfast, lunch, dinner and box lunches to take with you on your boat. The Island House is a more substantial restaurant on the waterfront. The view is great. There are a couple little shops one block from the waterfront on Main Street. Go hog wild. The Wachapreague Inn is located in town within easy walking distance of the restaurants, marinas and market. They offer efficiency apartments, 1 and 2 bedroom apartments, and an entire house with 13 beds and 5 1/2 bathrooms. The closest hotels outside of town are the the Days Inn in Onley or the Hampton Inn & Suites or Holiday Inn Express Hotel & Suites in Exmore. This little waterfront town is filled with modest homes on small lots. Most have inviting porches. It's an all-American kind of place. The big marina and boat ramps are the main attraction. In big storms there's sometimes flooding along the waterfront, but the town stays dry for the most part. The seaside biting flies and mosquitos are legendary. That's the price you pay to live on the water. The bugs are really only a problem on summer mornings and evenings. All homes and businesses in Wachapreague have their own wells and septic systems. Have them professionally checked if you're buying a house! A replacement alternative septic system might cost $15,000. There are many wonderful places to live on the Eastern Shore, but there are a few pitfalls to avoid too. Be an informed buyer and you'll be a happy buyer. 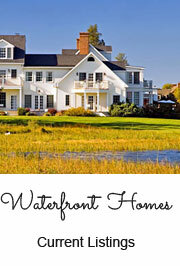 Learn about new developments at our real estate on the Eastern Shore page. Wachapreague is about 35 miles north of the Chesapeake Bay Bridge-Tunnel. Travel north on US Highway 13. After you pass through the tiny roadside towns of Painter and Keller, turn right onto Wachapreague Road (Rt 180). Continue about 4 miles; the road ends at the waterfront in town. Map of Wachapreague, VA with a satellite photo. Wachapreague is about 30 miles south of the Maryland state line. From the state line, travel south on US Highway 13. After you pass the community college and the Accomack Airport Industrial Park, turn left onto Wachapreague Road (Rt 180). Continue about 4 miles; the road ends at the waterfront in town.